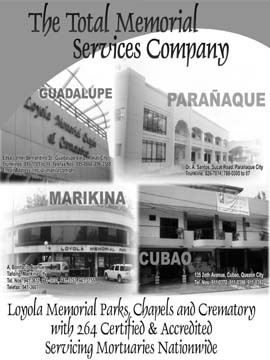 Loyola Memorial Service … an insurance that everyone must have..
Memorial service has been introduced in the Philippines by the late Senator Gil J Puyat on October 19, 1968 thus the birth of now Pre-need giant Loyola Plans Consolidated, Inc.
To date, many Filipinos, rich or poor, young and old are now open to the idea in investing in a memorial service. For a simple reason that's is cost efficient. You pay the service 5 years maximum and pay almost half the amount as compared to paying on a at need time. For the business people, who may not have any economical problem in paying at need service, memorial service help them solve problem on WHAT TO DO ? when a love one passes a way. Having a memorial service is the only insurance that a person will immdiately need as soon as one passes a way, but its also an insurance that a person buys the last, thinking its for the old and gray. Contary to what the public is thinking. Memorial service is only for 18-65 years of age of good health. 3. casketing 4. 4 days viewing at LOYOLA or any accredited chapels nationwide 5. hearse 6. delivery to the interment site. Other options like using the plan for cremation and urn or for the interment purposes can be done as instructed by the family members. Memorial service is packed with free Accidental Death Insurance, Life Insurance and so good health is required. The best part of the plan it can be absolutely free, under LOYOLA's Longevity Bonus provision. Which gives back 100% percent of the Base Value 15 years of full payment. Also included in the plan is 10% annual interest that is loaded to your policy one year after full payment. price ranges from 504.00 monthly to 12,000.00 monthly for 5 years. For inquiries and appointments look for Cherry Licup 09285061180, 09228254287, 3829886 and will immidiately return your call. Im the grandson of Dr. Hortensio D. Rojales. My lolo passed away yesterday and while I was looking for some documents I came across his Loyola Life Plan Inc. Certificate of ownership. His contract number is 594320-4 last Jan. 8, 1985. Can we claim the said amount of P7,200 to add for expenses in his funeral ? you may text me in my cellphone number 0918-2984801. Your immediate response is highly appreciated. Thank you and God Bless. This is my alternative email address. Follow up ko lang po ang status sa pag-file ko ng requirements in Cagayan de Oro Loyola Branch. I have already sent the additional requirements thru LBC. Your email response will be highly appreciated. Thanks and God BLess. 1.pick up of the body from the place of death 2. embalming 3. casketing 4. 4 days viewing at LOYOLA or any accredited chapels nationwide 5. cremation and urn for interment purposes? Deat Des, Cremation package is 1008.00 monthly for 5 years this is pre-need price. We cover from age 18 to 65 years of age. If you have an email address where i can send a proposal, please send me a message at licupcherryng@yahoo.com, or you can contact me at 09228254287, 09285061180, we can set a time and i can personally make a presentation to you at your most convinient time and place. Dear Des, Cremation package is 1008.00 monthly for 5 years this is pre-need price. We cover from age 18 to 65 years of age. If you have an email address where i can send a proposal, please send me a message at licupcherryng@yahoo.com, or you can contact me at 09228254287, 09285061180, we can set a time and i can personally make a presentation to you at your most convinient time and place. hi, can you kindly submit me a proposal/package plans with and without cremation; and benefits/services included in the proposed/packaged plans. thanks. you may course your query at inquiry@loyolaplans.com. Thanks! inquire lang po about d monthly premium of Homer Tome Andilab kung complete ba. to my accounts to the finder compalas,contancio compalas jr., paulina a compalas, please reply my mcg asap…. The columbaries are situated at the 3rd floor of Loyola Commonwealth. 1 vault can accommodate 4 cremated remains i regular size marble urn. pre-need price for the upgrading is is 47,700.00 payable in 5 years time. if with insurance (waiver of balance upon death, please on 275.00/year. this comes with waiver of installment upon death. Hello there! I am writing to inquire about a proposal/package plans with and without cremation; the benefits/services included in the proposed/packaged plans. My father is already 76yo. He also has no burial lot. My mom, 75 has a memorial plan(service) with Loyola and I have inquired already about it. If in case my mom goes first, hers would be buried at the Manila Memorial Park, Pque. City. I will be waiting for your e-mail so I together with my siblings could discuss and decide on it the earliest possible time. Thank you very much. My email add: mc_dlcalata@yahoo.com. Kindly include info of the ff: to your email in my first query. 1.pick up of the body from the place of death 2. embalming 3. casket 4. 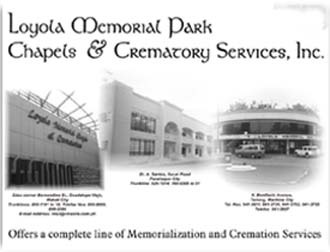 4 days viewing at LOYOLA or any accredited chapels nationwide 5. cremation and urn for interment purposes? Thanks!